In my attempts to sort this all out, I’ve tried nearly everything I could think of: I’ve taken digestive enzymes, more brands of probiotics than I can count, and psyllium husk supplements. I’ve sipped on a wide range of herbal teas, gone off hormonal birth control, had my thyroid levels tested, and my microbiome sequenced (nothing terribly interesting to report), eliminated artificial sweeteners from my diet, cut back on alcohol and sugar consumption (something I probably ought to have done anyway, digestive woes or not), and even tried the Whole30 elimination diet (gluten, dairy, soy, and I do fine together). I regularly exercise, consume a wide range of probiotic foods, eat slowly, drink plenty of water, and have a fiber-rich diet. And yet, I still felt like crap (sorry, not sorry, for the bad pun). Through it all I’ve also been quite fortunate: My friends, family, and especially my partner, Andrew, have been incredibly patient and supportive. I’ve been lucky to have the time and resources to eat healthfully and to make myself a wellness guinea pig — I’ve even been able to essentially make it my job to do so. And, on a less-serious, but still-quite-crucial note, the era of athleisure has brought with it an explosion of options when it comes to attractive high-waisted compression leggings (praise be, Outdoor Voices, Girlfriend Collective, and lululemon). And yet, I’ve also been largely let down by the medical system, with doctors making the same tired suggestions over and over again: eat lots of fibrous foods, take a probiotic, and, oh, do you drink enough water? * That is, until a few weeks ago, when — and again, I do not discount my extreme privilege here — I met with the wonderful medical and nutrition team at Canyon Ranch, a wellness resort in Tucson, Arizona. After running down my medical history, dietary habits, and the long list of things I’ve tried, my team made a few surprising suggestions. And here’s the crazy part, something, or somethings, have been working. All of which is both an exciting life update, and a really long-winded way of introducing this recipe; a recipe that incorporates digestion-friendly staples like oats, flaxseed, and ginger, while omitting the trio of foods I’ve — at least for the moment — cut out of my diet. A loose adaptation of Phoebe Lapine’s gingerbread beauty balls — for that (excellent!) recipe, pick up a copy of her fascinating memoir-slash-cookbook, The Wellness Project — these nutty (but nut-free) nuggets have been a great help in keeping me sane and satiated while doing my best to avoid eating three foods that previously featured heavily in my diet. 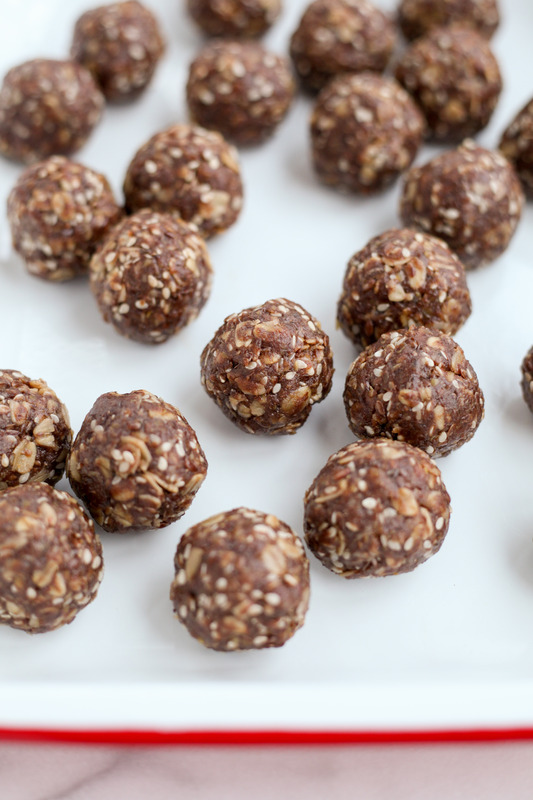 A few of these so-called bliss balls, paired with a yogurt (I’m partial to Siggi’s whole milk vanilla skyr), makes for a great grab-and-go breakfast. On their own, they’re a bittersweet, nutrient-dense snack. Either way, I think you’ll find them a useful recipe to have on hand for busy days. *All sound advice, but not terribly creative, or helpful in my case. **I hope it goes without saying that I’m not a medical professional or nutritionist, and this is not meant to serve as medical advice. This is just what has worked (and not worked) for me. In a large mixing bowl, whisk together the oats, flaxseed, sesame seeds, candied ginger, cacao, ginger, and salt. In a small mixing bowl, whisk together the tahini, honey, and ginger juice until smooth. Fold the tahini-honey mixture into the dry ingredients using a silicone spatula (you may need to use your hands towards the end to evenly blend everything together). Store refrigerated in an airtight container for up to 2 weeks. Here (and in general), I strongly-recommend using whole flaxseed, grinding the seeds to order, rather than flaxseed meal, as flaxseed meal turns rancid very easily thanks to the flaxseed's high oil content. I grind the seeds in a small coffee grinder than I use as a dedicated spice grinder. To further protect against rancidity, store any leftover flaxseed in the freezer. For a toastier, deeper, more sesame-dominant flavor, use toasted sesame seeds. This is my preference, but might not be everyone's cup of tea. Instead of toasting them myself (they're so easy to burn! ), I buy the seeds pre-toasted. Look for them in the international aisle of your supermarket or at an Asian market. The quality of tahini varies widely; my favorite brands are Soom and Seed + Mill. For consistency of size and even cooking, use a spring-loaded scoop to portion out the bliss balls; I used the middle-sized scoop in this set (#50), which is 1 1/2 tablespoons. 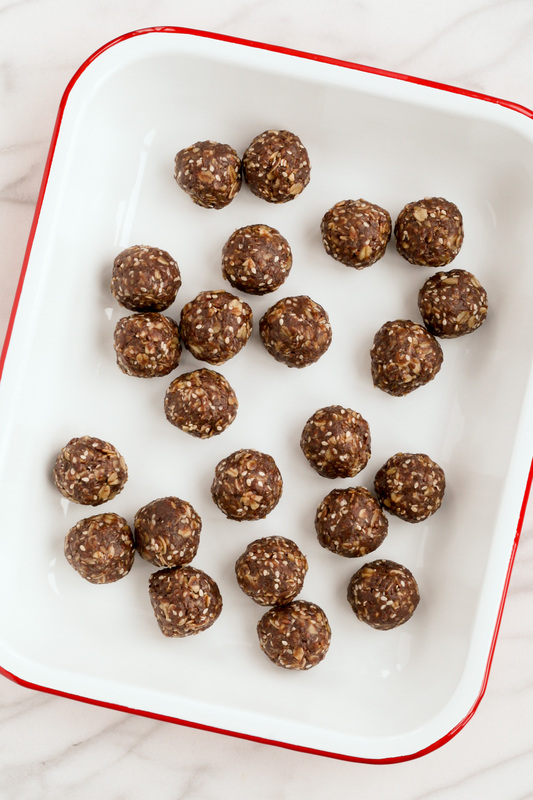 If you have more bliss balls than you think you'll eat in a week or two, know that these freeze great.